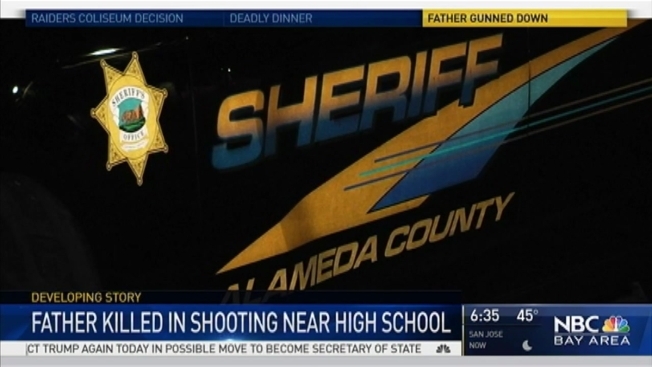 A 37-year-old father was gunned down outside his home Monday night in a possible drive-by shooting in Castro Valley, according to the Alameda County Sheriff's Office. Multiple gunshots were reported in the 4100 block of Wilson Avenue, near Redwood Road, around 6 p.m. The scene was near Castro Valley High School. Arriving deputies found the victim on the ground suffering from multiple gunshot wounds and being cared for by a friend who was administering CPR. Investigators said the man had a 9-year-old daughter who was home at the time of the shooting. Medical personnel also responded, but the victim was pronounced dead at the scene. The shooter was still at large late Monday night, officials said. Detectives and the crime lab have responded to the scene, and deputies are canvassing the neighborhood looking for witnesses and video surveillance footage, sheriff's officials said. Anyone with information about the shooting is urged to call the sheriff's investigation bureau at 510-667-3636.